Enstep is more than just a business, we’re a family. Our daughter, team members, and clients are all part of our story. Keep reading to learn more about our company’s roots, what it means to become a part of our growing family, and get to know our team. When you meet our owners, Brett and Amy Passmore, you will quickly understand what they value most – family and friends. Brett and Amy have been married for 18 years. Their daughter Kirsten has her own office at our Technology Center in Houston, TX. The couple’s life-long friends Kelly and Eric are also part of the team. Our hard-working IT professionals enjoy a friendly and laid back atmosphere with a comfortable family vibe. We’re dedicated to serving your IT needs while making sure our team members – a big part of our extended family – are happy as well. It’s not unusual to see our employees’ kids walking down the hallway or hanging out with Kirsten in her kid-friendly office. Family is the cornerstone of our success and ultimately the reason why Brett and Amy started Enstep in the first place. Every great company has an even greater story to tell. Enstep is no different. Brett and Amy’s journey to owning a successful Houston IT company has had a few bumps in the road, but they’ve never given up on their faith, love, family – or the company. It started many years ago when Brett was working for an IT consulting company. Eric was also working there at the same time. Brett’s boss had taken him under his wing, and because of that, he and Amy developed a friendship with his boss and wife. One night at dinner, Brett’s boss and his wife asked them a question that would change their lives forever. They knew how much Brett and Amy loved children and how close they were to their nieces and nephews, so they asked the young couple had they ever considered adoption. One thing led to another, and eventually, Brett and Amy started the adoption process. Thankfully the company helped them pay for a large portion of it. Amy and Brett were blessed with a five-month-old, 8-pound baby girl named Kristen! Although there were some complications due to being born premature, that did not deter the couple from making her part of their family. Soon after the adoption, Brett lost his job because the consulting company he was working for went bankrupt. It wasn’t just a tough time for the country’s economy but for their family as well. They had a baby, piles of hospital bills, and a new house. The IT market was flooded at that time because of the collapse of Enron, so Brett and his friend decided to start a company. The first Enstep was born. During this time, Amy and Brett were taking Kirsten to specialists where she was undergoing a multitude of tests. At the age of 2, she was diagnosed with Cerebral Palsy. Because of mounting hospital bills and a harsh economy, Brett had to sell their client list to a competing company and he went to work for them, where he stayed for about five years. The family slowly climbed out of debt and Brett eventually accepted a position as an IT director for a different company. But, after many long nights of praying and thoughtful considerations, a new path was chosen. Brett made the courageous decision to be self-employed, again and Enstep was re-born. By the end of 2010, Enstep Technology Solutions was officially a corporation, and today is a successful and expanding Houston IT service provider with 12 employees and continuously growing! Kirsten is officially a teenager now, and she has grown into a beautiful and smart young lady. She also glows with a warm, friendly spirit. And, like all kids her age, she likes to have fun, enjoys playing computer games, and loves reading. 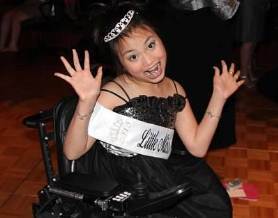 She proudly served as Little Miss Wheelchair Texas in 2013. She traveled around the state speaking at schools and different events. She can walk with assistance but most of the time she is in a wheelchair. Her mom says Kirsten impacts people, and when you meet her, you can see why. Through her participation in this program, she has inspired and helped other children. She is very interested in government, politics and aspires to be a politician one day. She sings in the Heaven Sent choir and is a member of a leadership training program called Teen Pact. She also attends a barrier-free camp each summer, where she has learned to climb a 30-foot rock wall. Through the years she has made many great friends. They hang out, go to parties, shopping at the mall, and have fun just like every other teenager in Texas. Learn more about what it means to become a part of our growing family and get to know our team. Learn more about partnering with Enstep. Learn more about Brett’s vision for your business. Meet your Virtual Technology Department. 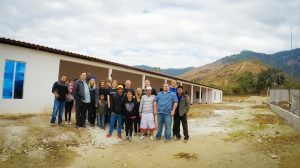 View Enstep’s role in the Houston area and how you can get involved too.